Results: Roman Reigns defeated Bray Wyatt via DQ; Akira Tozawa defeated Arya Daivari; The Drifter Elias Samson defeated Dean Ambrose via DQ; Finn Balor defeated Karl Anderson; Sasha Banks defeated Alicia Fox; Kalisto defeated Apollo Crews; Matt Hardy defeated Sheamus; Austin Aries defeated Tony Nese; Alexa Bliss defeated Mickie James; Samoa Joe and Bray Wyatt defeated Seth Rollins and Roman Reigns. This week’s show starts with Bray Wyatt and it would be an understatement to say that nobody knows how to feel about him anymore. There are cheers for the music hitting, then boos during the promo, and his appeal as either a babyface or heel swings based on who he’s in the ring with. You can say that about some other guys on the roster too, but it’s a problem that’s amplified with the Bray Wyatt character. He’s been defanged too many times and yet the character remains the same. There’s been no change, and while that doesn’t mean fans are rebelling against him, it does mean that indifference is setting in, and that just might be worse. The guy was WWE Champion heading into Wrestlemania and yet it’s hard to view him as a threat. That’s not good. It’s a shame that Wyatt’s character is flailing too because, even after all the losses and failed murders via refrigerator, he still has a charisma and presence that’s off the charts. The promo he cuts at the top of the show is still mostly nonsense, but when Roman comes out there’s something urgent, teasing, and confident there. Wyatt’s promos suggests a man who knows he’s in control, who knows his body type and speed in the ring allow for destruction, and who knows that he can get inside people’s heads. Now, if only the booking would catch up. After the Wyatt promo, Raw follows a pretty typical structure to get to the main event. With Roman and Bray nearly coming to blows in the ring, Kurt Angle comes out to give them a match right now. That match ends in a DQ when Samoa Joe interferes, which brings out Seth Rollins, which of course forces Angle to put all of them in a tag team match later on to see if anyone can really “get along.” It’s a trope that can work every now and then, but WWE leans on it far too often. Finally, the Drifter doesn’t just drift. This week he gets his first match on Raw, and it comes against Dean Ambrose. Somewhat surprisingly, it’s an evenly contested match. There’s no clean win either way though, as The Miz leaves his spot on commentary to lightly hit Samson and give him the DQ win, sticking one to Ambrose after last week’s kick in the nuts. It’s the second DQ ending in the first hour, but it at least moves the story forward. Plus, the Miz can get almost any screwy finish over when he’s the one heeling it up. I need Sasha Banks vs. Noam Dar in a match pronto. I also need commentary to lay off the idea that Sasha Banks wants to beat up Alicia Fox because she’s “jealous” that Fox has the love of Noam Dar. Kayfabe is dead, folks. We all know Sasha Banks is married. Also, it’s lazy and gross to make that the story when it very clearly isn’t that. While I’d usually be thrilled to see Enzo Amore laid out, I have to say that the backstage segment where Cass finds him beaten and unconscious is the most I’ve liked the tag team in quite some time. Something about Cass’ anger and protectiveness just hit me in the gut. More exploration of their friendship and less of them being obnoxious and barely coherent during in-ring promos please. In the best news of the night, Paul Heyman is in the house! It’s a relief to see him because Brock probably isn’t showing up any time soon, and there needs to be more to the build to the Fatal Fiveway at Extreme Rules than “the same five guys keep wrestling each other in different iterations.” Heyman raises the stakes instantly, making the Fatal Fiveway’s reward seem more immediate and real. On top of that, he completely puts over Finn Balor. 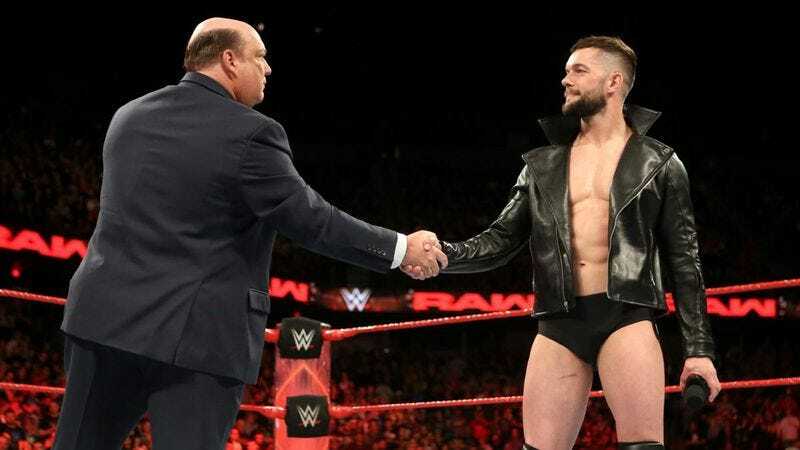 Judging by the very stilted promo he cuts, which doesn’t have any sense of urgency or hunger, the presence of Heyman is very necessary for the evolution of Finn Balor. Stilted promo aside, this one segment sold me on the Fatal Fiveway in a way that last week’s announcement didn’t. I have to say, I’m really loving Titus O’Neil and the Titus Brand right now. Time will tell if Apollo Crews gets that babyface rub he needs when he eventually turns on the guy, but for now I’m just enjoying Titus fully committing to the gimmick. Goldust gets his own pre-recorded promo this week and it’s pretty great. “The Golden Age is back,” he says, and let’s hope that he means it. I hate that Sheamus is losing to Matt Hardy in a singles match. And, as previously noted (many, many times), I hate that WWE can’t tell another type of story with its tag teams. Neville and Austin Aries are once again facing off at a PPV for the Cruiserweight Championship, and while I appreciate WWE telling a months-long story, I’m still not sold on Austin Aries as a babyface I can get behind. The main event ends up being pretty fun, as these tag matches with top guys usually are, but it’s difficult to not get preemptively worn down by the same old storytelling. Just like the Hardys-Shesaro feud, Raw is building to its Fatal Fiveway by having the same five guys wrestle each other in various iterations every single week. This week’s main event is the tag match. Then, tt the end of the show, Angle announces that next week Finn Balor will face Bray Wyatt and Samoa Joe in a Triple Threat match while Roman Reigns and Seth Rollins face off in singles action. They’re matches that I’m certainly looking forward to, but that doesn’t mean the storytelling isn’t missing the mark. There’s a complacency here that’s hard to ignore, even if the performers and in-ring work are top-notch.